Our last snowfall was March 31 and here are three shots of our inner courtyard. Daffodils, hyacinths, tulips and a gorgeous flowering magnolia tree are truly taking our breaths away. Sure we won the golden snow globe contest a couple times (this year we were fourth, thank God) but spring does come in April here. Cathy ended with, "But it's a beautiful sunny day today, so I think we've turned the corner for good." I should hope so for their sanity---after all--next Wednesday is May 1. BTW, that's a feeder that's suppose to attract Baltimore Orioles, who love oranges. Hmmmmmm, we'll see. The fact that it is still the month of March allows me to calmly post one more message about snow! Yes, that late winter storm you may have seen on the nightly news and on the weather channel this weekend did pass through us today--bringing a wet, sno-cone like snow of about 2". It stayed only on the grass, trees and bushes..leaving the roads wet but clear. It brings the season total to about 83" here in Harborcreek. The website goldensnowglobe.com which gets its totals from the NWS, has a similar total for Erie. And on their top 25 list of cities of 100,000 or more, we're at #4 for the season. Good---this is not a title to win! One beautiful effect the surprise snow coverage brought: cardinals right up to my window feeder. Against the snow: just beautiful. Our sisters are excellent observers--particularly when it comes to our chapel's stained glass windows. With the return of the early spring sun our side windows are "going crazy" when the sun's just right--and those of us who spend all our prayer times with them, know just when and how these special moments will occur. If you scroll down a little you'll see an unusual design on the ceramic floor that we caught at 12:45 pm last week--unusual because no one is usually in chapel at that time! One sister who loves our windows, too, asked me exactly what time it was when I took that picture--see? they really are knowledgeable! I've thought that it would be a great "adventure" to spend the whole of a bright sunny day in the chapel just taking pictures as the sun played around from 7:00 am to 9:00 pm. Maybe we'd have to do a sort of tag team every couple hours....but it would surely bring some great shots! As much as I love the 16 huge side windows there's something about the seven slender ones on the west side that grabs my interest. Again, at this time of year the late afternoon sun is giving us breathtaking views throughout Evening Prayer of these jewel-like sparklers. One of my friends and I have tried endlessly, and in vain, to capture the look, but we can't get it. All the photos fall terribly short. If you think these photos are good....you ought to see them in person! Finally, (I fear I could go on and on about this subject!) a couple of my friends told me of an unusual sun-event they saw in the chapel at about 5:00 pm Sunday. The sun, shining through the ceiling clerestory, hit one of the green EXIT signs and produced an unusual result on the wall. Can you see the beginnings of the word EXIT? See, I told you they are excellent observers. P.S. When professional photographers come here for an interview or photos, no matter how many possible places we show them for their shots, they always, always, always come back to the chapel. They love to catch settings with the windows in the background. Maybe they'd like to come and sit around for 14 hours some sunny day! Sunday afternoon it seemed dry enough and warm (46!?!) enough to drive out to the park at 18-mile creek and hike the short walking trail down to the lake and beach. We saw a couple fishermen, kids kicking a soccer ball around and a young family and their dog, George, out for a walk. But what really surprised me were two things: 1) that although the shore where we live is clear of ice chunks, the shore in North East is not; ditto for large sand-ice dunes; 2) I'm missing the beautiful colors of the natural world, as in these are color photographs though they may at first appear to be black and whites! Hurry up spring....bring on the yellow daffodils and forsythia, the red tulips, purple violets and greens everywhere! Our morning trip into Erie takes us down a street that has us heading right into the sunrise and this morning the timing was perfect. There it was through the trees. No cloud cover today...warm (50s) and sunny. Happy spring! Noon time brought a unique look through our stained glass windows. The uniqueness? No reflections on the side ceramic tiles. The angle must have been perfectly straight on--the windows appeared directly onto the floor and anything else in their way. Bright and colorful. Gorgeous. And evening brought the annual free small cone giveaway at our local Dairy Queen that opened today! "We'll take two chocolate-vanilla twists, please," we said--"and thank you." I asked the fellow we thought might be the owner, as he served us at the drive thru window, how many they expect to give away. "Last year we served 1,300 small cones," he answered. I figure that's about 100 an hour and a whole summer of goodwill for them! One week of temperatures over 50 degrees and the inner courtyard garden jumps at the chance to begin its springtime revelations! Sure the Christmas lights are still on the magnolia tree, but now the buds are also just around the corner. 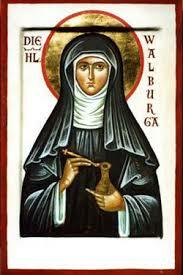 But the real celebration this weekend was the pronouncement of First Monastic Profession by Kathy McCarthy. The story and Smilebox on our community page tell the story beautifully. We are so blessed! Our simple environment for Lent. My (sad) attempt at being artsy--all lights off, only candle light and flash of the camera! I forgot to share the poem I read at the Celebration of Mary Oliver last week. It is from my favorite book of hers, Thirst. My favorite because it is so spiritual. Not spiritual in that organized religion kind of way---or with any religion in particular. Just in that way that acknowledges and treasures all the beautiful (spiritual) things about life: nature, people, events. Since I have spent the winter looking out of my window at the five newly planted trees from last summer and wondering and hoping that they are making it through the wilds of winter in the protective tubing we put around them, I chose this one on trees--and, of course as in all Mary Oliver poems--on more than trees. When I am among the trees,especially the willows and the honey locust,equally the beech, the oaks and the pines,they give off such hints of gladness.I would almost say that they save me, and daily. I am so distant from the hope of myself,in which I have goodness, and discernment,and never hurry through the worldbut walk slowly, and bow often. Around me the trees stir in their leavesand call out, "Stay awhile. "The light flows from their branches. And they call again, "It's simple," they say,"and you too have comeinto the world to do this, to go easy, to be filled with light, and to shine." The first five days of Lent have been anything but quiet, secluded or retiring. 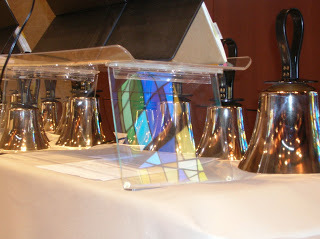 Well, that's not totally true--our chapel has taken on its annual simple, yet stunning Lenten environment, our daily prayer has changed to include Lenten hymns and responses and the first weekend of the Vigil and Sunday Mass brought back the heard-once-a-year songs and the beautiful deep and mournful sounds of the oboe. In the nearly twelve years of writing this blog I have posted poems by Mary Oliver 100 times. Her death January 17th brought a sadness to me and to many of my friends who are equally admirers of her extraordinary work. 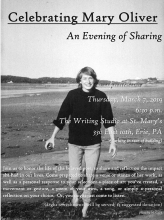 Tomorrow night I will be one of many, I'm sure, attendees at "Celebrating Mary Oliver" to be held at the former St. Mary's School building on E. 10th St. (aka: a local artists' colony of sorts, with a writing studio included). I'm taking my favorite book of hers, Thirst, with two or three choices to share. We'll see which one comes out. I should probably sponsor a private celebration and just recite all of her works from all of her books I own. My own poetry filibuster! We come by the annual "fever" of March Madness legitimately. After all, I live in the home of one of the strongest and longest lasting Erie high school girls rivalries: Villa vs St. Ben's! That's all I heard about growing up (my aunt was the Villa coach for years)--the annual basketball game between the two local girls basketball powerhouses...and this was years before Title IX and the real development of powerhouse teams! Then along came Kayla McBride in the early 2000s..first at VMA and then as a star for the Notre Dame Fighting Irish women's team and March Madness returned to my life. Ever since Kayla's stint at ND as an All-American, then onto the WNBA (currently for the Las Vegas Aces), my friends and I have been hooked on college women's basketball--and ND in particular. 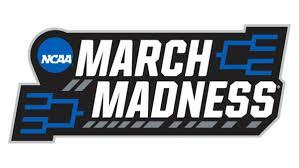 Last year they won the national championship with last second heroics--such fun (at least for the winners) and this season they are among the top 5-6 teams predicted to make a strong run for The Final Four and this year's championship. Unless you live in an anti-sports cave, quite understandable truly as it does become rather feverish, this month is a sports followers dream. The regular season ended this weekend, the conference championships are next weekend and the national championships begin the next: 64 teams playing single elimination rounds culminating April 5-8 for both the men's tournament (Minneapolis) and the women's (Tampa) and on every sports channel in sight. It is a great way to make it through the snowy weeks of winter and much fun reminiscing about our own school, recreation league and college teams of the past. Go Irish! When I was growing up there was a popular "test" at the time, named The Kudor Preference Test. It might still be around today-not sure. Anyway, it was made up of what seemed like 100s of questions and for each one you had to select from the three options what you're favorite was and what your least favorite was. Here's a sample I'll make up!